Born and raised in Longview, Texas, Williams attended Longview High School, where he played for the Longview Lobos high school football team and was teammates with Malcolm Kelly, Chris Ivory, and Robert Henson. Williams was a unanimous first-team all-district selection as a senior. Longview entered the 2005 UIL playoffs on a 10–0 season record, but lost 14–13 to Nick Florence's South Garland. He was also on the track team as a shot putter. Considered a three-star recruit by Rivals.com, Williams was listed as the No. 28 offensive guard prospect in the nation. He chose Oklahoma over offers from Louisiana State, Oklahoma State, and Texas A&M. Williams attended the University of Oklahoma, and played for coach Bob Stoops's Oklahoma Sooners football team from 2006 to 2009. Playing as a true freshman, Williams became the starter at right tackle just before the Missouri game in late October 2006 after Branndon Braxton went down with a broken leg, then started the last six games of the season. Williams played 462 snaps, had 75 knockdowns, and was named to The Sporting News' Freshman All-America second team. In his sophomore year, Williams saw action in all 14 games and had six starts at right tackle, sharing time with Branndon Braxton. As a junior in 2008, he started all 14 games, the first at left tackle and the remaining 13 at right tackle, and registered 131 knockdowns. He was part of a dominant 2008 Sooners offensive line that included Duke Robinson, Phil Loadholt, and allowed only 11 sacks all season, the third-lowest total of any team in the country. The two teams that finished above them (Air Force and Navy) combined to attempt 231 passes. Oklahoma attempted 476, and—featuring quarterback Sam Bradford and running back DeMarco Murray—became the highest-scoring team in the modern era (702 points). As the lone holdover from the 2008 offensive line, Williams was listed at No. 2 on Rivals.com′s 2009 preseason offensive tackle power ranking. He was also named to the 2009 Outland Trophy watch list. Despite missing the regular season finale due to injury, Williams led Oklahoma with 102 knockdown blocks and 885 plays, and was named an All-American by the American Football Coaches Association. Williams was considered one of the best offensive tackles available in the 2010 NFL Draft, and drew comparisons to Jammal Brown (who, coincidentally, would also join the Redskins that same offseason via trade). According to NFL.com's Gil Brandt, "Williams will be a first-round pick and can be a long-time starter in the NFL". Williams at Redskins training camp in 2011. Williams was drafted fourth overall by the Washington Redskins and agreed to a six-year, $60 million contract on July 30, 2010. In the 2010 season, Williams made his NFL debut, as well as his first career start, in Week 1 against the Dallas Cowboys. In the 2011 season, Williams was made an offensive co-captain along with veteran teammate Santana Moss. In Week 14, Williams and teammate Fred Davis were suspended for four games after repeatedly failing league drug tests. Williams suffered a bone bruise in his left foot during the first 2012 preseason game against the Buffalo Bills. Despite this injury, he started in the next two preseason games and was fully healed by the season opener against the New Orleans Saints. By the start of the season, his teammates voted for him again to be the offensive team captain. He suffered a right knee injury early in the Redskins' Week 3 game against the Cincinnati Bengals. After getting an MRI exam the next day, it was reported that Williams had another bone bruise. He was able to play in the next game against the Tampa Bay Buccaneers. Despite playing injured throughout the season, Williams had his best performance in 2012 and was selected for the 2013 Pro Bowl but couldn't participate in the Pro Bowl due to an injury when a night club fight occurred. After the Redskins' wild card playoff loss against the Seattle Seahawks on January 6, 2013, Williams struck Seahawks cornerback Richard Sherman in the face. He was fined $7,875 for the incident. After the Week 11 game of the 2013 season, Williams accused umpire Roy Ellison of swearing at him during the game with his accusation supported by several of his teammates. Ellison was in turn suspended by the NFL for one game. Despite the Redskins having a bad year as a team, Williams was chosen as the team's only player on the 2014 Pro Bowl team. On the NFL Network's Top 100 Players of 2014, Williams was voted the 60th best player (overall) in the league by his peers, an improvement from the 99th spot in 2013. He was voted into his third consecutive Pro Bowl on December 23, 2014. During the 2015 offseason, Williams lost nearly 30 pounds, going from a playing weight of roughly 345, to 318. On August 29, 2015, he agreed to a five-year, $66 million contract extension with $43.25 million guaranteed. Williams was ranked 47th on the NFL Top 100 Players of 2015. Williams was ranked 45th on the NFL Top 100 Players of 2016. On November 1, 2016, Williams was suspended four games for violating the NFL's substance abuse policy. Despite missing the games, Williams was named to his fifth straight Pro Bowl, was first-team All-Pro for the first time, and was ranked 47th by his peers on the NFL Top 100 Players of 2017. Williams started 10 games in 2017 while dealing with a knee injury for most of the season. He was eventually placed on injured reserve on December 22, 2017. Despite the injury, Williams was named to his sixth straight Pro Bowl, as well as his sixth straight ranking on the NFL Top 100 Players of 2018 at No. 57. Williams has been friends with running back Adrian Peterson since they were in high school. The two were teammates at the University of Oklahoma. Williams and Peterson also co-own a gym in Houston. Williams' nickname is "Silverback", named after the male gorilla. Williams has a huge gorilla tattoo on his back and owns gorilla art and an expensive bejeweled gorilla keychain. At the 2010 NFL Draft, he was introduced by league commissioner Roger Goodell with the moniker, after Williams dared Goodell to do it. ^ Tasman, Kyle. "Trent Williams ranked as NFL's best offensive lineman". 247 Sports. Retrieved May 23, 2018. ^ Miller, Von. "The 5 Toughest Guys I've Ever Faced". The Player's Tribune. Retrieved May 23, 2018. ^ "The NFL's best offensive tackles, No. 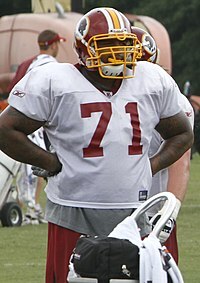 3: Trent Williams, Redskins". SI.com. Retrieved May 23, 2018. ^ "South Garland Stuns, Defeats Top Ranked Longview Lobos". November 12, 2005. ^ Brooks, Bucky, "Never too soon to look at top prospects for next year's draft", NFL.com, archived from the original on August 17, 2009, If he can display the footwork and lateral quickness to handle elite pass rushers, he could make a strong case for being the top tackle taken in next year's draft. ^ "Trent Williams Combine Profile", NFL.com, retrieved February 27, 2010 . ^ "Redskins give No. 4 overall pick Williams a six-year, $60M deal", NFL.com, July 30, 2010. ^ "Losing Redskins need better example from captains". WashingtonPost.com. Retrieved December 12, 2011. ^ "NFL suspends Redskins’ Trent Williams, Fred Davis", Washingtonpost.com, December 6, 2011. ^ Jones, Mike (August 11, 2012). "Redskins dealing with more injuries on the offensive line". WashingtonPost.com. Retrieved August 11, 2012. ^ Jones, Mike (October 4, 2012). "Trent Williams, Fred Davis earn back Redskins teammates' trust". WashingtonPost.com. Retrieved October 6, 2012. ^ Jones, Mike (September 24, 2012). "Trent Williams has a bone bruise in his right knee". WashingtonPost.com. Retrieved September 27, 2012. ^ Tinsman, Brian (December 26, 2012). "Three Redskins Selected To 2013 Pro Bowl". Redskins.com. Retrieved January 1, 2013. ^ Tinsman, Brian (December 29, 2012). "Williams Now Among NFL's Elite Left Tackles". Redskins.com. Retrieved January 1, 2013. ^ Brinson, Will (January 11, 2013). "Trent Williams fined $7,875 for hitting Richard Sherman in the face". cbssports.com. Retrieved January 14, 2014. ^ Rosenthal, Gregg (November 17, 2013). "Redskins' Trent Williams says official cursed at him". NFL.com. Retrieved November 17, 2013. ^ McNally, Brian (November 17, 2013). "Redskins notes: Trent Williams claims umpire cursed at him during game". WashingtonTimes.com. Retrieved November 27, 2013. ^ Jones, Mike (November 22, 2013). "NFL umpire Roy Ellison suspended for incident with Redskins' lineman Trent Williams". WashingtonPost.com. Retrieved November 27, 2013. ^ Maske, Mark (December 27, 2013). "Trent Williams is Redskins' lone Pro Bowl selection". WashingtonPost.com. Retrieved January 14, 2014. ^ Jones, Mike (December 23, 2014). "Trent Williams is Redskins' lone Pro Bowl selection". WashingtonPost.com. Retrieved March 6, 2015. ^ Clarke, Liz. "The weighting game: Trent Williams loses 27 pounds, Niles Paul gains it, to gird for the season". Washington Post. Retrieved August 15, 2015. ^ Orr, Conor (August 29, 2015). "Trent Williams, Redskins agree to record extension". NFL.com. Retrieved August 29, 2015. ^ "Redskin's Trent Williams Suspended Four Games". NFL.com. Retrieved November 1, 2016. ^ Czarda, Stephen (December 22, 2017). "Redskins Place Trent Williams On Injured Reserve, Sign Dare Ogunbowale". Redskins.com. ^ "NFL announces 2018 Pro Bowl rosters". NFL.com. December 19, 2017. Retrieved December 22, 2017. ^ Czarda, Stephen. "Trent Williams Named To 'Top 100 Players' List For Sixth Straight Year". Redskins.com. Retrieved May 23, 2018. ^ Paras, Matthew (August 19, 2018). "Williams vouches for Adrian Peterson: 'Hasn't slowed a step'". WashingtonTimes.com. Retrieved August 23, 2018. ^ Earls, Andre (August 22, 2018). "Trent Williams Wants To Show How Good Adrian Peterson Still Is On A Football Field". Redskins.com. Retrieved August 23, 2018. ^ "The story behind Trent Williams' nickname and Roger Goodell's introduction". The Washington Post. ^ Steinberg, Dan (July 21, 2011). "Stats, scores and schedules". The Washington Post. Wikimedia Commons has media related to Trent Williams. This page was last edited on 25 February 2019, at 22:43 (UTC).